12 photos by Les Tindall of this now closed section of the 5 foot 3 inch gauge Sao Paulo Railway. The railway climbed from the port of Santos up the 2500 foot Serra do Mar escarpment to Sao Paulo. It included a funicular section five miles long with five cable-worked inclines, each powered by a stationary steam engine. The gradient on the inclines was 1 in 12.5 or 8%. 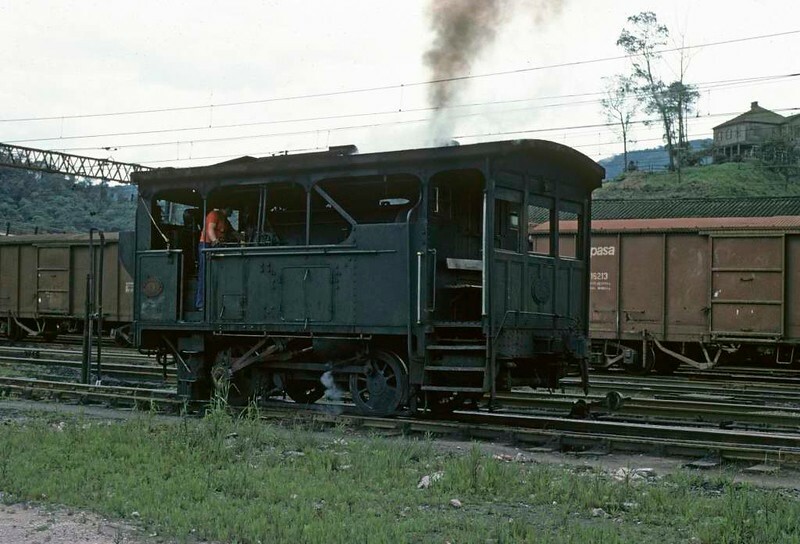 Twenty small 0-4-0T tram locos handled the trains between the inclines and at the top at Paranapiacaba. This section was in use 1901 - 1982, when it was replaced by a new electrified rack railway. Paranapiacaba station, Santos a Jundiai Railway, Brazil, 18 October 1976. No 14 built by Robert Stephenson in 1902 goes on shed. Photo by Les Tindall.